While collecting art is certainly enjoyable, you must keep in mind that, at a certain point, you are going to need to decide what you are going to do with the paintings you either no longer have space for, or have rotated out to make room for something new. 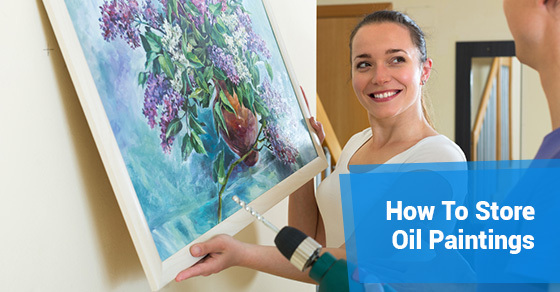 Whether you are storing your oil painting at home, or in a self storage unit or other space, below are some tips for storing oil paintings that will ensure your invaluable art remains in pristine condition for years to come. While you want to make sure you are investing appropriately in protecting your oil paintings, a storage unit is certainly something you don’t want to skimp on. If you are thinking about putting some of your oil paintings in a storage unit, consider investing in something that comes with robust security features and climate control. If you have large or difficult to carry pieces, you may also want to be able to pull your vehicle right up to the entrance of the storage unit. Storage pricing which includes drive up storage is really something to consider, because it minimizes the distance you have to carry the art, and therefore the chances that you are going to damage it while transferring it into or out of the unit. This is perhaps the most important element for successfully storing oil paintings. Whether you are keeping the paintings in your home, or in a storage unit, careful climate control will ensure that your oil paintings are protected from too much heat and humidity. An oil painting should ideally be stored in an environment that is between 65 and 70 degrees F all year round. While you certainly want to provide as much protection for your oil paintings as possible, you should avoid bubble wrap coming into direct contact with the surface of the painting. This is especially true in hot weather, as the bubble wrap can end up leaving an imprint on the paint or the varnish, and completely ruin your oil painting. Along with heat and humidity restrictions, appropriate darkness is the third main requirement for storing oil paintings. Over time, the more light your oil paintings are exposed to (especially ultraviolet light), the more the original colours are going to change. If you really want to ensure your oil paintings are kept in total darkness, checking out storage pricing at your local storage facility and investing in a self storage unit might just be your best bet. Whether you are storing art because of its sentimental value, financial value, or both, you need to know how to make sure it is protected at all times while in storage. Keep the above oil painting storage recommendations and requirements in mind, and never worry that your precious oil paintings will slowly deteriorate, or will be unrecognizable once you take them out of storage.